I quickly became used to the initial moment of blank stares and startled blinks. What disturbed me more was that I couldn't clear up people's confusion. I wanted my family, roommates, and friends to understand why I was spending my college years studying this obscure field. But, my explanations left even me mentally scratching my head. Let me begin with the name. History and Sociology of Science is the name of my major at the University of Pennsylvania, but it belongs to the field known as science and technology studies (STS). Unlike biology or physics, science and technology studies takes a historical or sociological approach to science. Early anatomy lesson. Science and Technology Studies looks at the social forces that have historically shaped scientific knowledge. Source: National Library of Medicine. People often define their majors by the courses they take. However, my major included seemingly unrelated courses such as Environmental History, Chinese Medicine, and Science, Technology and War. Listing the courses I took usually just earned me even more dubious looks. When I took the first few courses in my major, I only knew that they stimulated my intellectual curiosity like nothing before. As I got in deeper, I came to understand the power of science studies. It changes how you look at the world. When I first went to college, I had only the faintest image of how science and technology worked. I imagined scientists and engineers working feverishly in their labs, with individual sparks of creativity or genius providing breakthroughs. New discoveries and inventions would result, adding to the progress of science and society. The end. Through science and technology studies, I learned that reality is much more complicated. Science comes from the Latin word scientia, which essentially means knowledge. Science, technology, and medicine all represent certain types of knowledge. What I came to understand was that knowledge is not merely "discovered" as some truth about the world or reality. It is actually created and shaped by human minds. This makes science a human endeavor deeply influenced by human cultures and societies. At the same time, science deeply influences human cultures and societies. The world changes when one sees modern science as the result of individual quirks and habits, relations among scientists and administrators, corporate cash flows, government policies, and popular world views. I began to understand the social factors shaping what we accept as scientific truths. For example, disease is often taken at face value in modern medicine. Nonetheless, a closer look reveals that definitions of disease are fluid and constantly changing. Arthritis and senility, once considered normal in the aging process, are now defined as diseases in a society that expects people to function normally until death. Obesity has also recently been defined as a disease, yet it was once considered a sign of healthiness and wealth in certain societies. I have also learned to view past scientific beliefs in their own contexts. Rather than scoffing at Aristotelian dynamics and geocentric theory as outdated nonsense, historians of science try to understand how those ideas made sense in certain time periods. Past ideas are not necessarily less scientific than current ideas just because they were discarded. Instead, they were discarded because they no longer fit the changing worldview of science. The ability to mentally separate science from physical truth is important. This is not to say that modern science is somehow false. The achievements of modern science in such a short time period are unparalleled in human history. 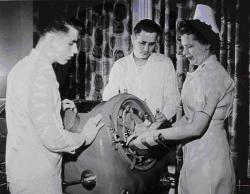 Patient in iron lung, around 1949. Social forces continue to shape modern science, technology, and medicine. Source: National Library of Medicine. One must remember that scientists are people too, and people's experiences of the world are different. What people have observed and written down has never been as purely objective as we might imagine. Like a Rorschach test and its ambiguous inkblots, reality can often be seen differently depending on the individual's worldview. For instance, human anatomy might seem straightforward to describe. 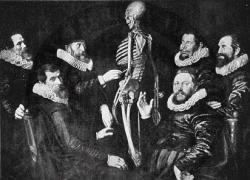 But, past anatomical sketches show how social conceptions of gender affected perceptions of "reality". The Greek physician Galen described female anatomy as simply inverted male anatomy, and this viewpoint was reflected in anatomical drawings up until the 17th century. History and Sociology of Science is an interdisciplinary major at the University of Pennsylvania. Even as I considered myself primarily a humanities and social sciences person, I maintained a strong interest in the natural sciences. As I struggled to decide between majoring in English and neurobiology during sophomore year, I stumbled upon History and Sociology of Science as the perfect solution. This is somewhat ironic, given the friction that has existed at times between science and technology studies and the natural sciences. Some of the more extreme STS people have focused on criticizing or debunking modern science's claim to truth, which has tended to make scientists feel defensive. This academic debate was known as the "Science Wars" in the 1990s. Despite this war of words, professors and students in History and Sociology of Science are drawn to the field because of their multi-disciplinary interests. Many of my former professors hold advanced degrees in "hard" sciences such as chemistry and biology in addition to science and technology studies. A self-proclaimed "unusual beast, or maybe not," Dr. Robert Aronowitz joined Penn's History and Sociology of Science department after obtaining his M.D. from the Yale University. He continues to practice medicine as he teaches the history of 20th century disease, epidemiology, and public health. "I was alarmed, disturbed and passionate about the fact that a purely biological view of human body focusing on mechanisms of disease misses so much of what suffering, pain, and people's expectations from hospitals and healers are," Aronowitz states, recalling how his experiences in Internal Medicine encouraged him to study the social context of disease. Graduate students also come from both the natural and social sciences -- several of my former teaching assistants are evidence. "I was looking for a program that combined my interests in history, biology, and medicine," Divya Roy explains. As an undergraduate double major in molecular biology and history, Roy found that History and Sociology of Science allowed her to pursue her interests in an interdisciplinary way. Babi Hammond, another Penn graduate student, describes learning of science and technology studies through reading the popular writings of Stephen Jay Gould, the late but renowned paleontologist and evolutionary biologist. Hammond came to Penn with undergraduate degrees in history and the history of science. "Like many college students, I was also looking for ways to do work that was interesting and for ways to do good in the world," Hammond says. "I thought that helping develop a better understanding of science was a way to do both, because science plays such a large role in the world today." Looking back, my choice of university for undergraduate education seems even more pivotal now. Few universities offer science and technology studies programs like Penn. "One thing unique about our field is that history of science really started out as a graduate level research specialty," Nathan Ensmenger notes. An assistant professor in the History and Sociology of Science department, Ensmenger first worked as an engineer in the software industry. Ensmenger observes that science and technology studies is "institutionally confined, but speaking to a larger public," when asked about the future of the field. He explains that the field is not expanding in terms of more university departments, but is becoming more relevant to scholars, policymakers, and the general public. Penn's History and Sociology of Science department is even more unique in its approach to science and technology studies. STS is often divided into sub-specialties, specifically the history of science, history of technology, and history of medicine. But the HSSC department decided to ensure that its faculty and students are familiar with all three areas. Knowledge of science, technology and medicine allows students to be "trilingual," according to Janet Tighe, History and Sociology of Science faculty member and Associate Director of the related Health and Societies program. She went on to describe the department's philosophy of having knowledge in each area "cross-fertilize" and enhance overall understanding. Due to its broad scope, science and technology studies is suited to people of diverse background. Many of my fellow classmates chose History and Sociology of Science to balance their majors in the natural sciences. Some plan to attend medical school after college, and use science studies to give them a different perspective on modern medicine. Others end up going to law or business school, specializing in science-related areas and ventures. Despite graduating already, I asked the faculty about how they might recommend History and Sociology of Science to a prospective student. Professor Aronowitz replied, "Great humanistic basis for pursuing medical or science careers. It's vaccinating yourself against socialization you get later (in medical school)." Professor Ensmenger answered, "Particularly suited for people interested in approaching a topic from multiple perspectives, and for those training to be in fields where scientific and technical knowledge is important, but also knowledge of larger social systems." Professor Tighe responded, "For students well versed in sciences, and for those a little weak. If we are doing our jobs right and integrating disciplines, each student is pushed to learn something new."